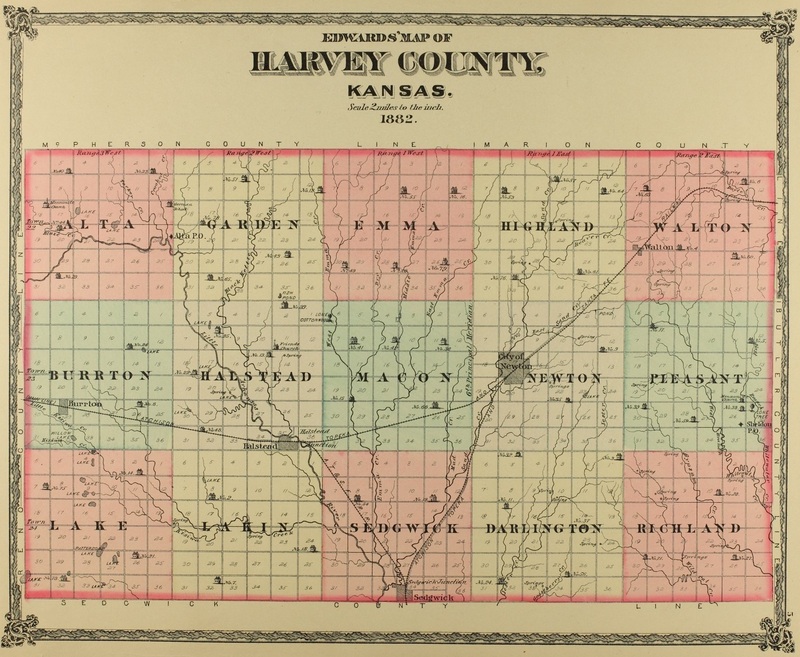 Harvey County was created from portions of Sedgwick, McPherson, and Marion Counties. The original plan was to form the new county out of the surrounding counties by taking ten northern townships from Sedgwick County, three townships from southeast McPherson County, and two townships from southwest Marion County. In February 1872, the bill was passed into law with only thirteen townships in the new county since the Marion County representative refused to support the new county unless the two Marion County townships were withdrawn from the plan. The story then evolved into political payoffs when a Marion County legislature candidate promised to help Harvey County get Walton Twp from Marion County in return for help in getting elected. The city of Peabody, hoping to start their own county, opposed the move. Both groups raised funds to support their positions (i.e. the buying of Senate votes). Senate members accepted bribes from both factions. The bill to annex Walton Twp to Harvey County passed on March 6, 1873 by one vote. A motion to reconsider was tabled until after the dinner hour. When the Senate adjourned for dinner, the committee who favored annexation rushed the bill to Governor Harvey, who signed it immediately.